Before deciding on paint colors I had a few steps to take to prep my workshop before hand. First, I did what I’ve been planning on doing since the beginning of this project. 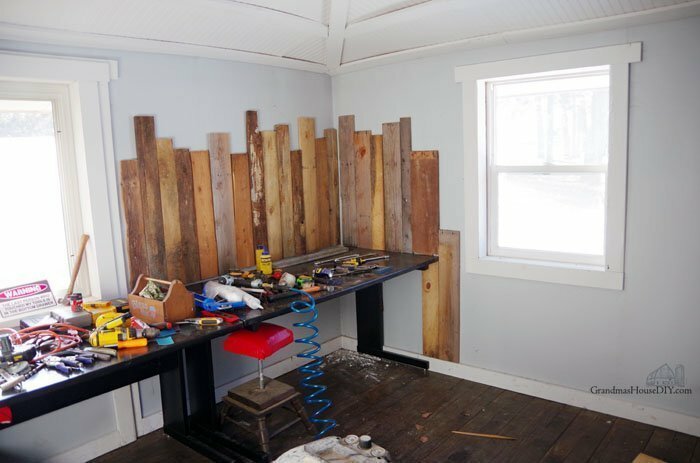 I put up a barn/pallet wood wainscoting along one wall and around my work tables. And I also got all my tools organized and put away which was kinda imperative because I couldn’t even walk in here before I got that done! With those jobs complete I really got excited about this space! This is my favorite thought that went through my head when deciding on my paint: THIS IS MY “PLAY” ROOM: It needs to be practical but… omg… it could also be fun… and fancy!…. Right?! So, I joined the dark side. I’M GONNA PAINT MY CEILING BLACK! (A tip I use whenever I paint out a room is that I never get the paint until literally the moment I’m going to use it. Its easy to get excited and buy all your paint at once but, the truth is, unless you’re willing to do some SERIOUS mixing you will never be able to get that paint as well mixed as they do at the store. It is called Sail the Seas, also by Valspar. 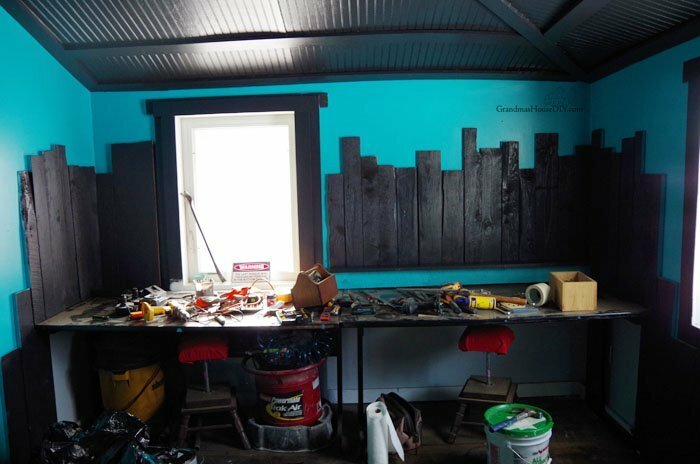 I want a fancy workshop – What of it? Every single drop of paint that entered this room was high gloss. 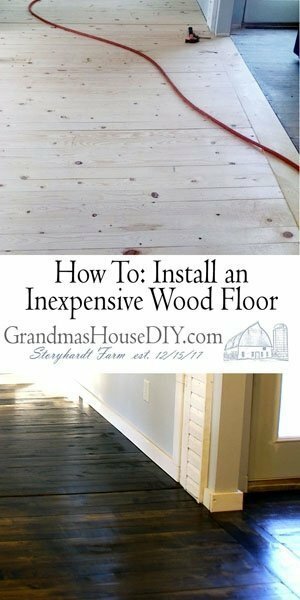 I used almost two gallons of the “black” and I cussed my beadboard and all my trim out the entire time. I used the thickest nap roller that I could purchase and that worked great except every piece of wood and trim I had to go around by hand. Honestly, I literally created one of the most difficult painting situations for myself that I could imagine! I went back and touched up with the teal and then the black and then the teal again. This went on for DAYS and it is still not perfect! So apparently the only true black is Rustoleum’s BLACK lol. My door is painted in Rustoleum high gloss black along with my tables and so I guess my “black” paint was actually just a really dark gray even though it was definitely the blackest black I could find on a swatch. 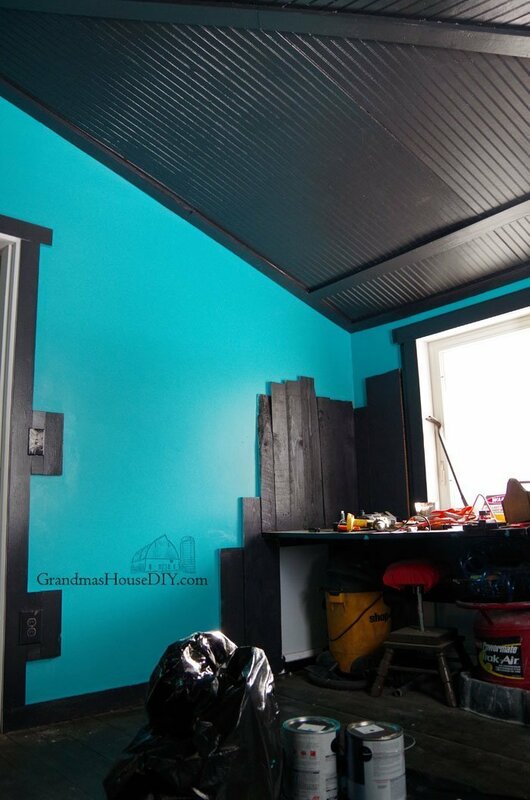 Honestly, it doesn’t REALLY bother me yet but if it totally drives me bonkers I’ll just paint the tables and this side of the door in my trim color. I also brought up the sliding barn door from my basement that I’ve been meaning to bring up here for 9 months which I also painted in my teal color. Confession: I was going to paint out the entire inside of the closet too but I just spent HOURS filling and organizing it and I just could not bring myself to empty it! 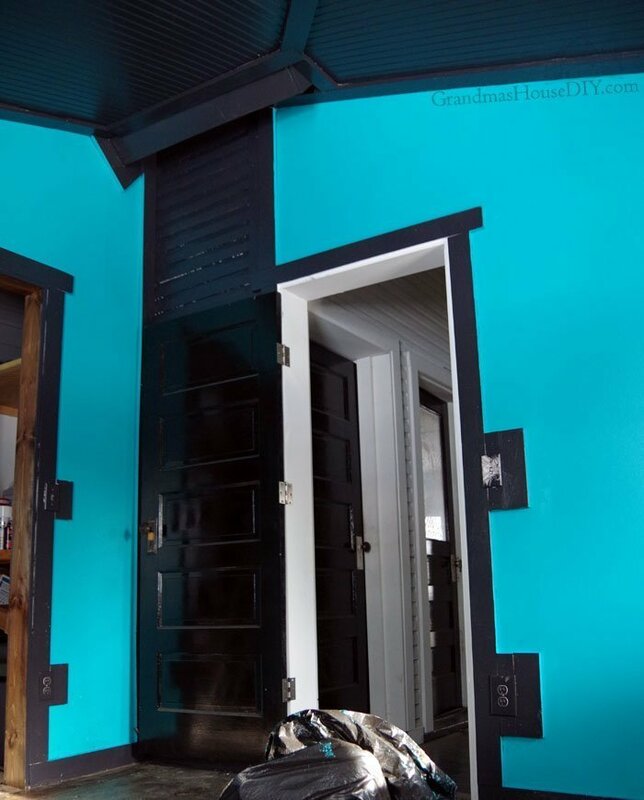 I also feel like painting it out in either the black or teal would not only be a difficult job but also may be a bit overkill. For now it is what it is lol. Every time I walk in here I still think I’ve lost my mind… But it also makes me giggle and smile like a little kid… So, yeah, I love it. Looking up at the dark ceiling I was so worried it would feel claustrophobic and “falling down” but its actually quite the opposite, it feels like it soars away. Ok for those of you who absolutely hate me for painting the barn and pallet wood. I DON’T BLAME YOU! 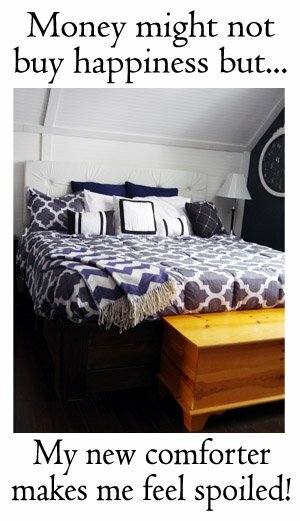 You guys know I rarely paint out wood and I have NEVER painted a piece of furniture that was solid wood. I’m just moving away from such a rustic look in my home… OUTSIDE my home though (namely in my garage) I will be making it up to all of you barn and pallet wood lovers I promise! Finally, I can start making a real workshop out of this place! Very fun! Good for you for breaking out of the mold and doing what makes you happy. 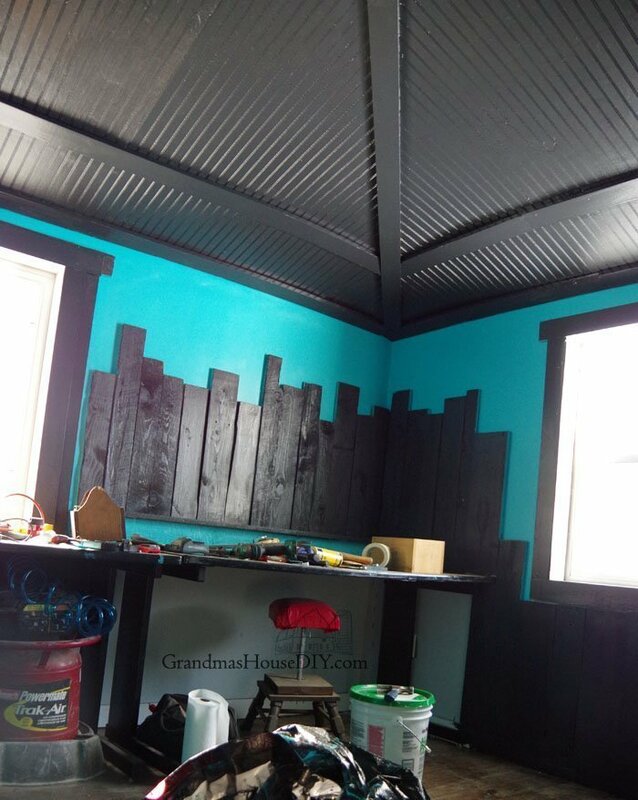 I was trying to think what the black wainscoting reminded me of and you said it perfectly…looks like a city skyline against a beautiful deep blue sky. By an old beater from an electric mixer The goodwill near me almost always has them. Put it in your drill to mix your paint. Stick your roller cover on it to spin it out after you clean it. Just make sure to put the roller cover in a 5 gallon bucket. Thanks for the tips Lynn! Zowie! 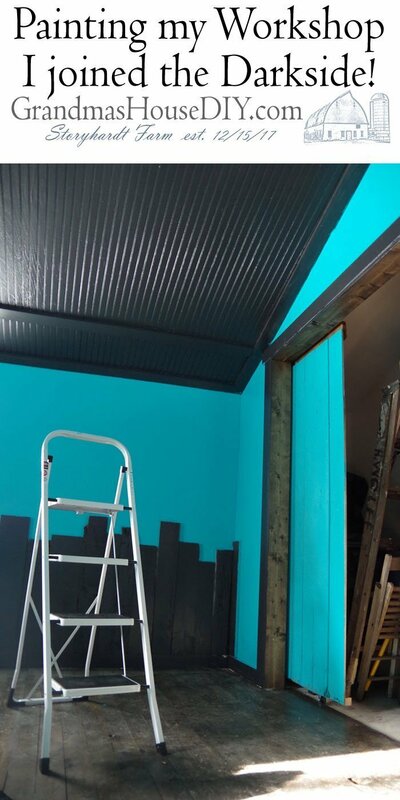 If you had little yellow rectangles on the wainscotting, it would look like tall city buildings – the “New York” room! I know that’s not what you were going for 🙂 Love the blue! let us know what it’s like to work in there once you get all set up! Toni, a friend of mine said I should add sparkling fairy lights to it just for that same look! I might be tempted lol, thanks so much for coming by! 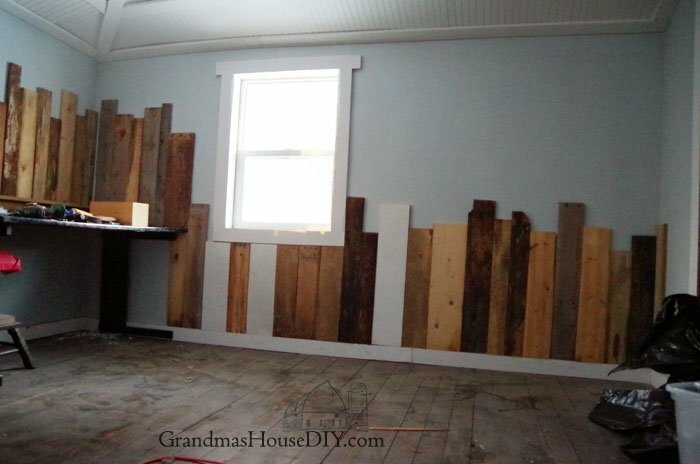 I forgot to ask – did you lower the work table, or shorten the wood pieces on the wall beside the window? They look longer in the unpainted version. Thanks! Hi Toni, no actually that’s just perspective because I painted the bottom of the shelf along the table the teal, it looks like the wall behind it so it looks like I lifted the wainscoting up when its just paint. I LOVE the colors! I really like the black ceiling. And I agree, it definitely looks like a cityscape. I do have one question…are you going to paint under the table? IMHO it looks a little ‘off’. My eye was drawn to the different color immediately, unless you have another plan to close in the table. Great job! 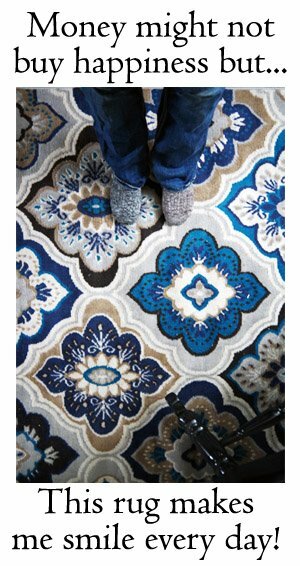 Hi Tina, I totally agree it does look unfinished under there. The plan is to add two sets of drawers (on either end) and a black curtain between them to cover it all up 🙂 Thanks for coming by! I love it!!! If you had asked before doing it, I would have said no way but it is really great! Good for you for following your dreams!! Thanks Barbara, I kinda held my breath the whole time wondering if I’d lost my mind lol But then I thought I could always paint over it if I hated it but I’m so glad I took the risk. I come in here now and it just makes me smile!